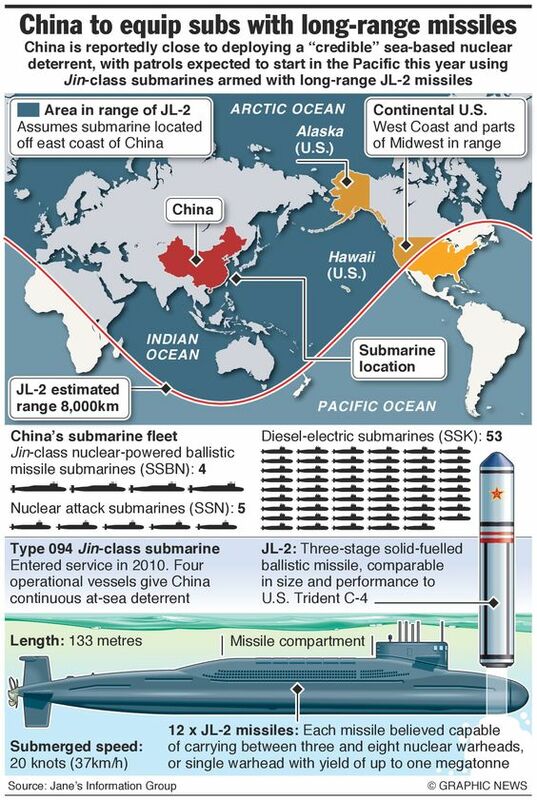 The PLAN [People’s Liberation Army Navy] has begun replacing its small and aging fleet of nuclear-powered submarines, i. e., five Han-class nuclear-powered attack boats (SSN) and one Xia-class nuclear-powered ballistic missile-carrying submarine (SSBN). The first in a new class of SSNs, the Type- 093 Shang-class was launched in 2002 and commissioned in 2006; one additional Type-093 has since also entered service, and some sources estimate that up to eight boats in this class could be built, though other analysts expect that the PLAN will field more advanced Type-095s instead. The PLAN has also launched two new SSBNs of the Type-094 Jin-class, each intended to carry 12 JL- 2 submarine-launched ballistic missiles (SLBMs) with a range of 7,000 kilometers (three times greater than that of the JL-1 SLBM carried by the Xia) once the JL-2 enters operational readiness. The Type 094 “Jin” class, is expected to be much more capable overall platform. Similar to other nuclear submarines of Chinese design, this class also experienced reactor problems at first. Four boats are reportedly operational, but are expected to remain without ballistic missiles until the ongoing trials of the intercontinental-range JL-2 ballistic missile system are completed. This missile is predicted to have a range of 7,000-8,000 km and could reach targets in Alaska or India from positions in the Yellow or South China Seas. However, due to the missile’s unknown operational status as of October 2014, it is not entirely clear whether China already has a fully functioning sea-based nuclear deterrent capability in place. Given the Cold War era SSBN requirements listed above, providing the necessary technologies is obviously only a minor part of the conditions that need to be fulfilled to reach this goal. Rigorous crew training, regular exercises, and extended global patrols would need to be continuously demonstrated in order for China to match the criteria set by the U. S. Navy. Overall, based on visual qualitative analysis comparison, the Type 094 is likely much louder than the super quiet Ohio. It has a large sail, deviates from the ideal shape, and includes vents. An advanced propeller will mitigate, but not eradicate these problems. However, this is not to say that the Type 094 is going to be a loud platform overall; it is likely a small step ahead of the Delta III SSBN. It is important to consider that the average speed of an SSBN on station is less than five knots; comparisons made in terms of attack boats, which travel in excess of 15 knots have limited applicability. According to reports, the Delta III registered between 125-130 dB at 4-8 knots, the likely speed of an SSBN on patrol. Considering modern propeller design, this correlates with certain Chinese reports, which argue that the Type 094’s acoustic signature was 120 dB (Bell 2009: 34-35). Once at sea there are a limited number of platforms capable of finding and tracking an SSBN on patrol. There is no guarantee that these platforms will actually find the SSBN, only a probability. The more assets and efforts used, the higher the probability of detection and tracking. Effective tracking, moreover, requires the integrated use of cues from very diverse sources of information such as “satellite imagery, antisubmarine aircraft, and fixed, passive underwater acoustic arrays”. As of 2017, 48 JL-2 launchers are deployed on submarines. As of 2018, China is developing the JL-3 as a future replacement. China continues to produce the JIN-class SSBN, with four commissioned and at least one other under construction. China’s JIN SSBNs, which are equipped to carry up to 12 CSS-N-14 (JL-2) SLBMs, are the country’s first viable sea-based nuclear deterrent. The problems resulting from China’s narrow and shallow territorial waters are most relevant for submarine operations but also affect naval surface vessels, at least to some degree. The defining characteristic of the submarine as a naval weapon system is, after all, its ability to hide from enemy view. This ability is compromised in shallow waters, at least for transiting submarines, because “[t]he deeper the submarine can go the bigger the volume of sea it can hide in”. Shallow waters are also difficult terrain to navigate safely, especially for larger submarines such as China’s giant new Jin class SSBN. At over 130 m in length, its hull diameter must be large enough to accommodate the JL-2 missile, which is about 13 m long. Shallow waters therefore not only make such vessels vulnerable to detection, but also to accidental grounding. China’s next-generation Type 096 SSBN, reportedly to be armed with the follow-on JL-3 SLBM, will likely begin construction in the early-2020s. Based on the 40-plus-year service life of China’s first-generation SSNs, China will operate its JIN and Type 096 SSBN fleets concurrently. This entry was posted in China, Warship, Weapons by MSW. Bookmark the permalink.